- 1x Fish Eye Lens Works like an ultra-wide angle lens. With it, your phone lens will capture rounded images instead of square ones. - 1x 2in1 Macro Lens and Wide Angle Lens Two lenses combined for easy storage and transport. The wide angle lens will allow you to capture larger scenes, for example cityscapes, large group shots and more. The macro will enable you to get super close to objects, to pick up all those small details you usually miss. - 1 x Circular polarized lens (CPL) filters polarized light, reducing reflections, enhancing colors and increasing contrast. The adjustable filter allows for easy control of the effect of polarization. - 1 x The telephoto lens gets up close with 2x optical magnification. - 1 x Universal Clip-On Lens Holder Screw the lens of your choice into the clip and simply place it over your device's camera. Please note: The macro and wide angle lenses are screwed together. Unleash your creativity and take and share amazing photos with this lens kit. The universal design of the kit allows you to use it easily with numerous portable devices. Compatible with: Smart Phones, Tablets and Laptops including: iPhone 8, 7, SE, 6, 5, 5S, 5C, 4, 3; Samsung Galaxy S7, S7 edge, S6, S6 edge, S5, S4, S3; iPad 2, 3, 4, Air; and many more. FIVE LENSES IN ONE CARRYING CASE: Great mobile photography for back or front facing cameras. 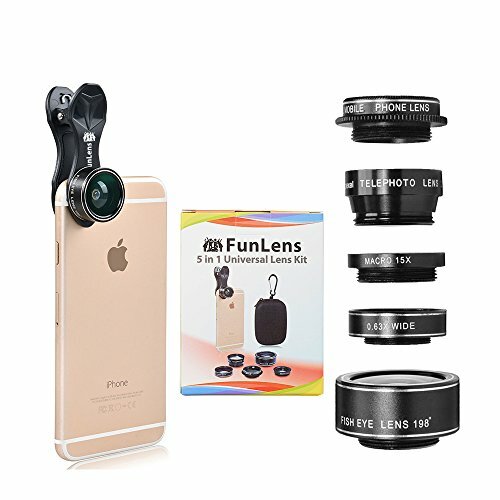 Includes 5 quick connect lenses: telephoto lens, circular polarized lens (CPL), fisheye lens, macro lens and wide angle lens. Combine with your favorite apps to share photos instantly. HIGH COMPATIBILITY: The lenses included in this set can be used with a wide range of cell phones and mobile devices including iPhone 8, 7, 6, 5, 5C, 5S, 4, 3; Samsung Galaxy S6, S5, S4, S3; iPad Air 2, Air, 4, 3, 2; and many more. HIGH QUALITY DESIGN: The lenses are made from aluminum to increase the durability of the product. MULTI-FUNCTION: Create fun shots with the Fisheye Lens which allows the phone/Pads to shoot fun circular pictures, the wide-angle lens to shoot landscape or even group pictures, the macro lens to take pics of small objects like flowers, the telephoto lens for shooting distance pictures, the CPL lens to eliminate reflected light and create beautiful color. If you have any questions about this product by FunLens, contact us by completing and submitting the form below. If you are looking for a specif part number, please include it with your message.